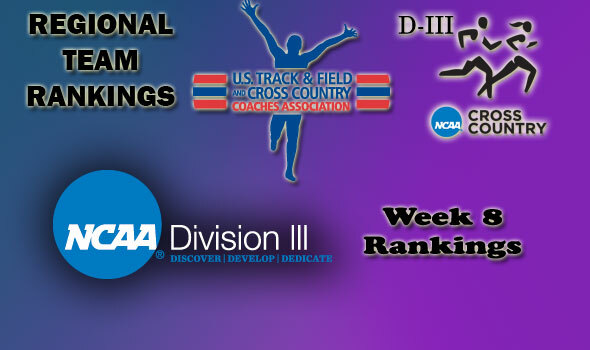 … It was another heavy week of shuffling in the regional D-III rankings as conference championships cleared the landscape … Middlebury’s men made their presence known with a surprising showing at the NESCAC Championships where they took the crown and, as a result, is rewarded with a No. 1 ranking in their region, jumping from No. 7 … Centre College’s men is making its latest appeal for the top portion of the South/Southeast region as the move back to No. 2, they were the region’s preseason No. 1 … the West region was turned on its head a bit after the results of the Northwest Conference and SCAC came known … Whitworth is now ranked No. 1 in the West, followed by new No. 2 Colorado College. Making appearances in the rankings for the first time this season … MEN – Vassar (Atlantic, 10th), Swarthmore (Mideast, 9th), Saint Vincent (Mideast, 10th), George Fox (West, 10th) …WOMEN – SUNY Oneonta (Atlantic, 10th), Central (Iowa) (Central, 10th), Manchester (Great Lakes, 8th). 5 Grinnell Grinnell, Iowa Midwest Conf. 8 St. Norbert De Pere, Wis. Midwest Conf. 2 Lewis & Clark Portland, Ore. Northwest Conf. 3 Whitworth Spokane, Wash. Northwest Conf. 4 Willamette Salem, Ore. Northwest Conf. 5 Whitman Walla Walla, Wash. Northwest Conf.